Raising a few head of beef cows on small acreage can be a rewarding, family-oriented experience. However, caring for even a few cattle can be time consuming. 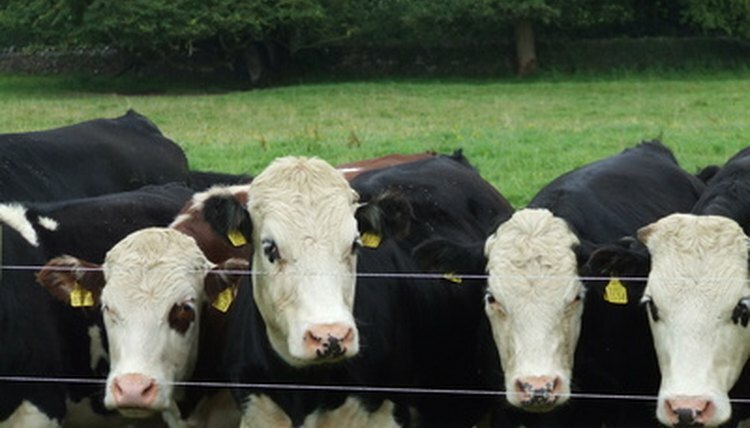 To save time and money, research cattle breeds beforehand and choose animals that will perform the best on your land. For example, consider breeds that gain weight efficiently and are relatively docile, which can reduce the tending time for your livestock. After all, when you are raising cattle on a small farm, you will probably interact with them more than if you had them on range land. Look for cattle that are healthy and lean. According to Dale R. ZoBell, PhD, a beef cattle specialist, fat cattle do not gain meat weight as efficiently. Animals of different breeds can be kept together, but ensure they are generally the same size so a single feeding program will be adequate. Estimate how many cows you will be able to raise on your land. Take into consideration your climate and your water availability as well as the breed of cattle you have chosen. Avoid overcrowding your acreage. Overcrowding can stress your animals and have a negative impact on their overall health leading to poor weight gain and increased vet bills. Fence in your property. Check your local fencing regulations and adhere to them. Loose cattle can be lost or hurt, and owners can be liable for any damage they might cause. Provide shelter so the cattle can get out of the weather. Otherwise, animals use energy to adjust to the weather rather than gain weight. Avoid pasturing in rich alfalfa as it can cause bloat. Walk through your land to ensure you do not have any poisonous plants. Add supplements, such as vitamins and minerals, to your feed if your pasture or other feed sources do not meet minimal dietary requirements. Work out a feeding schedule if you decide you want to add grain to the diet. Observe your cattle daily. This will allow you to assess the general health of your animals. You will be able to recognize changes in individual animals. Restrain animals in a squeeze when you worm them or otherwise handle them. Unrestrained animals can be dangerous to work with. Avoid keeping a bull on a small acreage. Otherwise, you may not have adequate space to keep him separate from the other animals. If you want to breed your cows, you can make alternative arrangements such as artificial insemination. Provide a parasite management schedule. Having animals on fewer acres increases the likelihood of parasite infestation which reduces efficient weight gain. Include both internal parasites, such as worms, and external parasites, such as lice in your program. Keep updated records. Many products for parasite control can not be used within certain dates of slaughter. Also include weight management and other records so you can tweak your overall management over subsequent years. You can arrange for your veterinarian or an experienced cattle owner to walk through your land with you to identify dangerous plants or other trouble spots. The amount of cattle your acreage will be able to support depends on many factors, including whether you intend to keep the animals on pasture or have a feedlot setup. Some breeds do better in some conditions than others. For example, Brahmas tend not to do as well in cold climates as other breeds do.